I guessed (and hoped) that Pope Benedict would say something significant about the priesthood and priestly spirituality. I did not expect him to declare a "Year for Priests". Linking this with the 150th anniversary of the death of St. John Vianney which providentially fell on the Solemnity of The Sacred Heart - and perhaps it was this that inspired him - is a wonderful gift. Our main focus is on Christ the High Priest. After the Lord, we need to look again at the life and example of the Cure D'Ars. it would also be good to consider other priestly "heroes" and saints, and there is much to be learnt from looking at how Catholic priests have been depicted in literature and the Media. 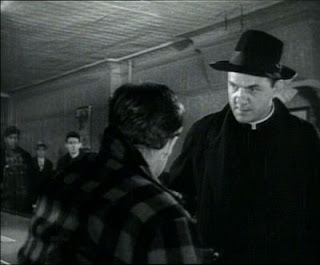 The picture above is of Karl Malden in the film, "On The Waterfront". He gave one of the best dramatic portraits of a Catholic priest. My church was built by Fr. John O'Connor, the model for Chesterton's "Father Brown". Chesterton admired Fr. O'Connor's intellectual abilities. In Father Brown we also recognise humility and humanity. St. John Vianney can seem a very distant and daunting figure, with a spiritual life that is way beyond anything most priests can attempt. But this is a mistake. It is worth re-reading Trochu's magnificent biography (for my money one of the best biographies of a saint). When Pope John Paul 11 visited Ars, he spoke about the need to learn from the example of St. Vianney. Some priests criticised the Pope for saying this, suggesting that the Cure D'Ars was almost irrelevant to the priestly life today. Following John Paul's visit, the Fraternite de St. Jean Vianney was founded in Ars (its headquarters being at the Seminary there). Even a short pilgrimage to Ars (I have been at least five times) leaves a lasting impression and encourages most priests to be more generous in living their vocation. It's good to have models and heroes, and I hope to share some of mine from time to time during the coming year - from the Cure D'Ars to Blessed Damien and beyond.